What do you think of when you think of Florida? Lately, you probably think of hurricanes. But at other times, do you think of Disney World, Miami, or Key West? If you travel via the busy interstates, that’s what you’ll see. 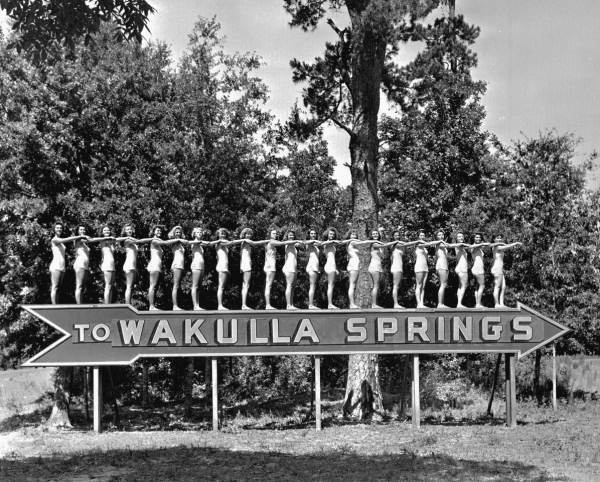 But have you ever wondered where tourists went before interstates, even before Disney? As a history lover, I prefer old places, places that used to be popular, places that seem to have been forgotten in today’s fast-paced world. And there are many of those places in Florida. They’re not high-tech or shiny, modern or sophisticated, but they capture the charm of a forgotten era. Come with me as I take you down old Highway 98 which runs along the western side of Florida and visit some of these places. This month, I want to introduce you to one of my favorite forgotten places, Wakulla Springs. 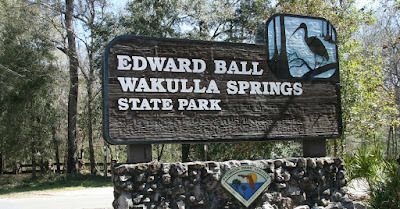 The entrance to Edward Ball Wakulla Springs State Park leads you to a road bordered by trees and shrubs that conceal the limestone caverns below. When financier Edward Ball bought the property in 1931, he realized he’d found a gem in the Florida wilderness. Set on the Wakulla River, Wakulla Springs is one of the deepest and largest freshwater springs in the world, so deep in fact that mastodon skeletons are still visible 150 feet below its surface. Instead of using the property for pulpwood as Bell intended, he decided to develop the land as an attraction focused on the preservation of wildlife and its natural habitat. No expense was spared when Ball built a luxury lodge for his wealthy guests. Today, the 1937 Mediterranean revival-style lodge is virtually unchanged, and as you step through its door, you enter another era. Ball used the finest materials available such as heart cypress and Tennessee marble throughout the lodge. The ceiling is a work of art – a decorative painting of local wildlife scenes, with influences of European folk art, Arabic scroll work and Native American art. The lodge boasts two Art Deco masterpieces – a marble and iron staircase and the original elevator. The elevator, with its walnut grain and marquetry panels, is the only known surviving Art Deco elevator still in use. 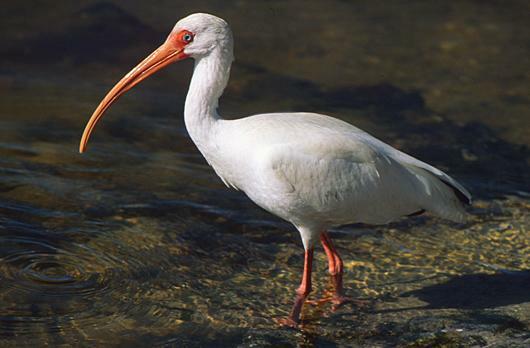 The wrought iron railing of the staircase was made on site and illustrates wildlife from the river, with true-to-size limpkins and herons. Each landing of the three-story staircase is a massive marble panel cut from one block. 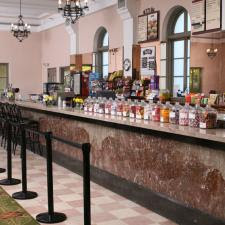 In addition, the world's longest known marble bar, seventy feet, three inches long, is in the soda fountain/gift shop. Marble top chess tables invite guests to a game. You can visit the park on a day trip or stay in one of the 27 vintage guest rooms overnight. These rooms are much like they were when the lodge was built, and in keeping with the nostalgic era, have no televisions. 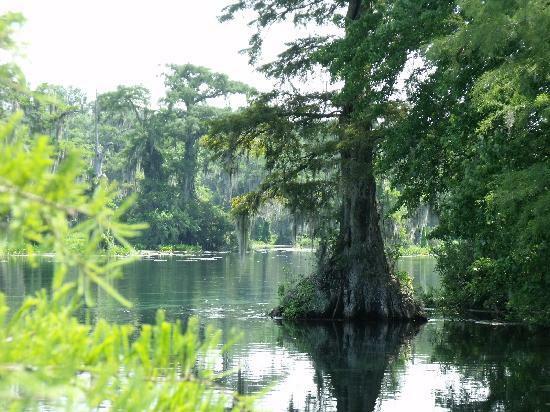 One of the unique and original activities at the park is the 45 minute boat trip that meanders slowly along a two-mile loop among bald cypress trees, waterfowl and alligators of all sizes. Manatees are sighted at certain times of the year. My husband and I were privileged to see a large group of the animals who appeared to be doing some type of water ballet. We were also witness to an eagle-osprey aerial chase. 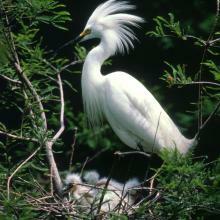 The area is a treasure-trove for wildlife photographers. Hangin' out on a log. Swimmers brave the cool water in the marked-off swimming areas during the summer months, and park rangers make sure the gators stay away. A diving platform allows diving into the deep spring. There are other springs in the park for cave-diving. Hollywood has used the park’s natural environment for several movies, transforming it into the jungles or Africa or South America. The first film shot in the park was “Tarzan’s Secret Treasure” in 1941 staring Johnny Weissmuller as Tarzan and Maureen O’Sullivan as Jane. 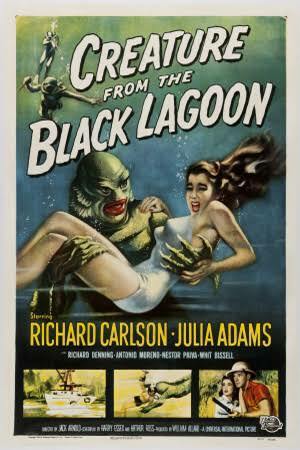 In 1954, the underwater scenes for “Creature from the Black Lagoon” were filmed at the Springs. Gene Hackman filmed "Night Moves" at the Lodge in 1959, and the Lloyd Bridges film "Around the World Under the Sea" was filmed at the Lodge in 1966. In 1976, a film adaption of the classic young adult novel "Joe Panther", starring Ricardo Montalban, was shot on the premises. The last major film production to date was the blockbuster "Airport 77,” with underwater scenes of the downed airliner filmed in the Springs. Producers went so far as to submerge a large part of a wide body jet in the water for the production. Have you ever seen any of the movies mentioned above? I had to laugh at the similarity of the two movie posters. Why are the women always carried? *Leave a comment for a chance to win a copy of Rebel Light, a Civil War love story set in Florida. When I think of Florida it is Walt Disney World and Palm Trees that come to mind. I visited Florida for my first time at the end of May and saw my first Manatee. I love them. Thank you for the post and the chance to win your book. Hi Cindy, Thanks for your comment. Hope you win the book! Connie, I don't know where your friend lives, but if you're not in a hurry, you can avoid the interstate for the most part. Thank you for sharing your great post. I had no idea about the state park. We always stay on the interstate for our DisneyWorld trip. Have a great day! Hi Melanie, Thanks for your comment. 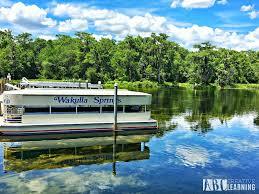 As you can tell, Wakulla Springs is way off the beaten path if you're going to Disney! Wonderful and informative post about Florida. When I think of Florida, I think of vacation get away for summer beach goers and winter snowbirds, Disney World, traffic, and beautiful seashores. Do not enter me in the giveaway. I have a copy of Rebel Light. A wonderful historical novel to read. Hi Marilyn. Thanks for your comment. I'm so glad you liked Rebel Light! Thanks for a great post and giveaway. The Civil War is one of my favorite eras. Hey Connie, Thanks for your comment. Hope you get to Florida some day! This is a great post! I suddenly find myself wanting to visit this area of Florida. I love the pictures and the information about the movies filmed there. Thanks for your comment, Debbie. I hope you get to visit the Forgotten Coast of Florida. 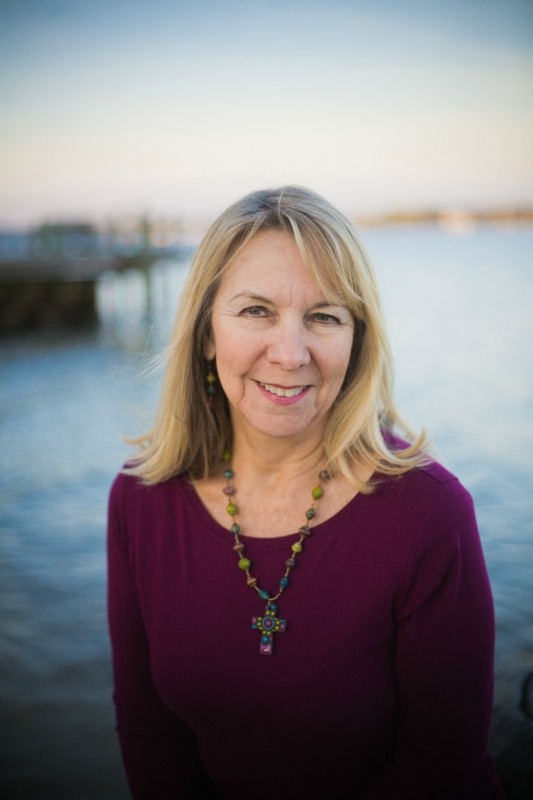 Marilyn, thank you for this fascinating post! I would love to visit the Keyes! Hi Caryl, Thanks for your comment. I'd love to visit the Keys someday too.